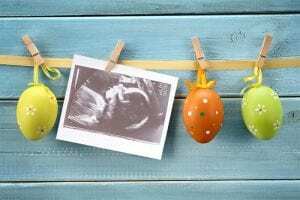 When you find out that you’re expecting a baby in the spring, use one of the many fun pregnancy-announcement ideas with an Easter or spring theme. The spring season is a time to celebrate new growth. It’s also a fun time to let family and friends know that you’re expecting a baby by using one of the many spring and Easter ideas available. You can customize any idea to make it your own with names, initials, favorite colors or even the baby’s gender if you already know. Decorate a large egg with the phrase “We’re Eggs-pecting.” Put the egg in a large nest that you can give as an Easter gift. When recipients look at the egg, they will know your surprise. Take a few pictures of you and your significant other when the trees and flowers begin to bloom. In a few of the pictures, paint an egg design on your stomach as a way to signal to everyone who looks at the pictures that you have a surprise hidden inside. A fun decoration to use in the home to announce your pregnancy is a chalkboard. Use bright colors when writing the announcement. You could tie in something about hunting for eggs and the hunt being over because you have found your special bundle. 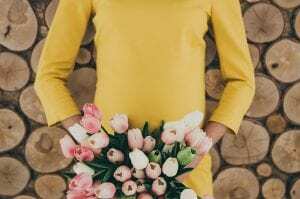 As flowers begin to bloom, you can use this to your advantage for a pregnancy announcement. Take a picture of a basket or a pot of flowers next to a board with a simple message about when the baby is due. You could also include a pair of baby shoes or a baby animal in the picture. When children hunt for their Easter eggs, you can hide a few that have a special message. You can write a message on a piece of paper that you put inside the egg or a short message on the outside of the egg. The message would tell your child that he or she is going to be a big brother or sister. This is also a good idea to use if grandparents help children hunt for eggs. Have the Easter Bunny hold a sign that lets your child or children know about the new baby. 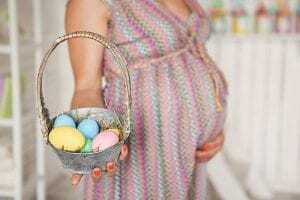 The Easter Bunny could also leave a few gifts for the new baby as well as baskets for the other child or children. Combine a poster or chalkboard with an egg design on your stomach as one of the pregnancy-announcement ideas for the new baby. You could put a set of rabbit ears on each corner of the board, one in pink and another in blue if you don’t know whether you’re expecting a girl or a boy. Your pregnancy announcement doesn’t have to be anything extravagant in the spring as there are beautiful backdrops to use. Stand in front of a lake or in front of a pasture with blooming flowers as you hold your stomach. Wear a shirt that says you’re “eggs-pecting” on the front. You can wear the shirt while taking pictures with family and friends on Easter to surprise them. 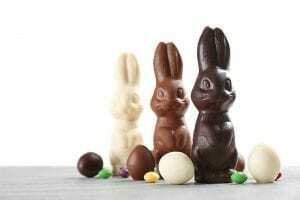 Create a family nest with eggs or chocolate bunnies and candy for the parents and eggs for the new baby as well as some for other children you have. Print the date on the egg for the new baby. If you know the gender, wrap hard-boiled eggs in a blue or pink ribbon. Include one that is left uncooked. This one should be wrapped with the ribbon color that matches the gender of the baby. When someone cracks this egg, everyone will know the gender of the baby.